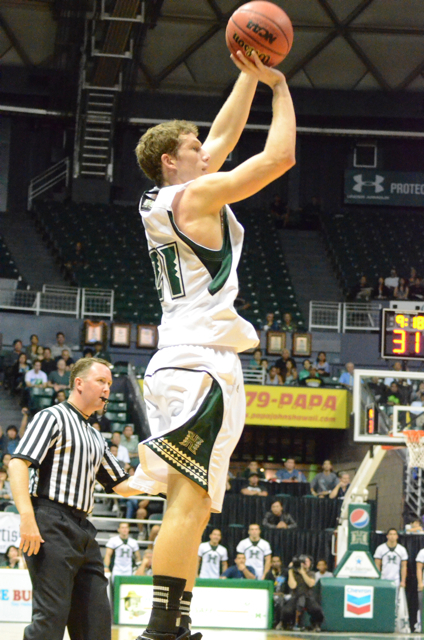 There are no breaks in the Big West Conference for the Hawai’i basketball team. Every opponent offers a unique challenge, and the next one is no exception. The Warriors will host UC Davis in a Big West contest on Saturday night at the Stan Sheriff Center. Hawai’i is 10-7 overall and 4-2 in the conference, with all four victories in the Sheriff Center. UC Davis is 6-10 and 2-3. The Aggies’ record may not be impressive at first glance, but it is already an improvement from last season, when they finished 5-26 and in last place in the conference at 3-13. The Warriors were one of the teams that beat UC Davis last season, and they understand that the Aggies are not the same as a year ago. The Aggies certainly have a couple of offensive weapons. Corey Hawkins, a 6-foot-3 sophomore guard, ranks fourth in the Big West in scoring with 17.9 points per game. He has scored 20 or more points in six games this season, and leads the conference in free throw percentage at .905. He is the son of former NBA guard Hersey Hawkins. The Aggies also have the best 3-point shooter in the conference in 6-4 junior Ryan Sypkens. He is averaging 14.2 points per game, and leads the Big West with 58 3-pointers. He ranks among the top 10 nationally for 3-pointers per game (3.6) and 3-point percentage (.483). UC Davis also has an inside presence in the form of 6-7 sophomore J.T. Adenrele, who is averaging 11.4 points and 5.4 rebounds per game. Josh Ritchart, a 6-9 junior, adds 8.8 points and 4.5 rebounds per game. Ryan Howley, a 6-5 senior, leads the team in rebounding at 8.4 per game. The Warriors will counter with their “big three” of 6-10 center Vander Joaquim, and 6-8 forwards Christian Standhardinger and Isaac Fotu. They are the top three scorers and rebounders for Hawaii, and are combining for 38.9 points and 23.3 rebounds per game. The backcourt remains a work in progress for the Warriors, and at least six players could see time at the guard positions: Brandon Spearman, Brandon Jawato, Hauns Brereton, Ozren Pavlovic, Jace Tavita and Garrett Jefferson. The Warriors are currently in second place in the Big West, one game behind Long Beach State. The key has been defense. In six conference games, the Warriors are limiting opponents to a .406 field goal percentage, including .318 from 3-point range. When: Saturday, Jan. 19, 7:00 p.m.
Television: Live statewide on OCSports – Channels 16 (SD) and 1016 (HD). Streaming Video: Live video streaming is available on ocsports.tv. Ticket Information: $26 (lower); $18 (upper-adult); $16 (upper-sr. citizen); $5 (upper-youth, ages 4-HS); UH Manoa students free with validated ID. Parking $6. Promotions: Farmers Insurance Hawaii is the sponsor of Saturday’s contest and will distribute 1,000 sling bags and award a $100 gas card at halftime. The team will hold an autograph session on the arena concourse following the conclusion of the game. Come on UH, go full effort, take care of the ball, shoot well, and defeat UC Davis, another athletic, good shooting team! Manoa Maniacs come out in full force, and hopefully 6000-7000 will show up for a last home game until early February. UH BB team will be on a 4 game road swing in following weeks. Hope UH will get win, so important, to go to 5-2 and keep pace with the top two teams in conference! what happened to Manroop Clair?, he’s not listed as one of the guards that you’ve stated that could see some time at a guard positon. range on his shots and he’s a better F/T shooter too. So if you ask me, I don’t know what Arnold is doing with Clair sitting but something is up. You can’t start 5 straight games, contribute, play pretty well for a freshman and then not play the next 3 games. Well, 2 minutes in Irvine which I would say as not playing. And to not even mentioning Clair in the above article tells me that Clair might even be suspended. Who know, maybe it’s a hoax. We’ll see tonight. My guess is that he’s not going to play. I hope I’m glad that I’m wrong. I enjoy watching him play and I think he can be a special player. He just turned 18 not too long ago so he has a whole future ahead of him. Right now, I’m a little disgusted. I hope it’s more of an academic thing where Roop can buckle down and get his grades back in good standings. Even if it is academically bad, I’d rather he be that than he sulking on the bench or not giving it his all in practice. I wonder if Roop got complacent after those starts and thought he had it made and didn’t go full blast in practice and having Coach teach him a lesson, hahahahahaha. Plenny scenario’s for us to gossip or just talk about though in keeping our attention on UH bb. All I know is if this team doesn’t figure out a true point to run this offense there is NO way I guarantee you, absolutely NO way this team makes it to the tourney let alone the Big West Championship. Honestly this league is weak as hell and Hawaii should be stomping everyone but without a solid point guard they will not go very far. Teams Hawaii has faced has legit guards and believe me I think the whole league has figured out our game plan of feeding the bigs consistently. If our guards, especially the point could create and not force careless turnovers we would be winning easily by at least 10 sometimes 20 point leads. Believe me experts, I know there is more to the game than just the point guard but right now its a huge problem. Jawato, thank God, has been a nice surprise to be able to get his shot going. Hauns has been coming on steadily but really needs to be in constant attack mode. Spearman is another one that just needs to be in attack mode all game. He showed his desire to score in the Illinois game but I haven’t seen that hunger in getting to the rim since. Regardless, I’m glad Ozren is finally getting some minutes, his play is pretty smooth, definitely the Euro type but nice to see his confidence gaining to where he is actually able to contribute more. I commend him for taking the reigns at point, but that is definitely not where he can be most effective. Jace is the dude that really needs to step his game up. I get on this guy because every time I see him play I cringe. I know he can be the steady hand at the point but he just always seems so erratic on the court when he’s pressured. Anyway, I hope these guys figure out there turnover situation cause it will haunt them when the second half to the season starts and teams have familiarity with what we do. Dayton if you feel I shouldn’t do the above quote, please delete my post. I don’t know if Roop is out/suspended, don’t think so, check out in above video who is in the background shooting threes , Manroop, Caleb, Ozi, I think Hauns. Roop, He is part of team, great young guy. For that scramble 3 point catch up team, if UH down, with less than a minute to go, probably Roop would be in there, he gets up the court quickly and bombs away the 3 ball with quick release. Ozren, must be really separating himself from other guys, BB smarts to run team. Although he would be great 2 or 3. I agree with some others, maybe let Spearman run PG, however, Spearman seems to be a shoot first guard, or attack rim instead of looking for Bigs or other spot up shooters. Spearman is the strongest of guards, going to the hole, that is a positive. Spearman started and comes off the bench. Needs to get his offense going. He was pulled, in fact , especially for the upperclassmen, the rule: if you make a turnover, you are coming out. May be, practice performance, you are right, he might not even be handling pressure from Keith Shamburger, getting whacked, physical defense, on him and Roop, losing the ball. Also, it could be BB IQ, at this level, and running the PG position, it is like the QB in football, making the reads, audibles, he has to know what to call on O and D. Decision making. Roop is young , and correct , just recently turned 18, so lot of BB to play over next 3 years. We shall see how the Ozi, who is a great BB IQ guy too, with euro skillset. works out, probably he bring ball up, with screens set by Bigs and Jawato, Hauns or Spearman helping him out. It is a Team effort , the advancing and running O and D sets. We fans at SSC like ALL the 12, they are good students, friends and players, however they get W’s even if Vander has to hit 7 threes, a Win is a Win bottom line, UH and Gib have to keep on winning for seeding in Big West Tourney, it is up for grabs, the NCAA bid. Roop not timid and strong with the ball, I believe we see him in action, especially with the upcoming 4 game road trip. If it is academics, we shall see. Maybe he doesn’t make road trip like Trevor Wiseman. Bottom line, Coach’s decision. Heck , if they activate, Dyrbe, and he took PG position and took UH to the NCAA’s , and it was Gib’s decision, we would all be going Right On! Spot On! Maybe Dayton will find out or the other Media guy. Basically, I think it’s going to be a shared situation as far as handling the ball up court for the remainder of the season. Every player has made a lot of turnovers, thus it’s a team thing, it’s not just a point guard thing. To use PG as the sole reason for turning the ball over is just plain wrong. It’s not only dribbling, it’s also passing and positioning. It’s coaching. The coaches need to do a better job of coaching the players. I’d like a question, if Butler coach Brad Stevens was coaching the UH team, do you think UH’s record would be better or worse then 10-7 at this time of the year? I rest my case. No question, Brad Stevens is a better coach than Gib Arnold. If he was coaching UH, I think UH would be at least 15-2. Be as it may, turnovers will not kill Hawaii. It’s all coming down to field coach percentage (making shots) and making free throws. If we did that against Irvine and Long Beach we would have won. We just have to get better at the line. To win the conference it will come down to winning or losing in very close games. Every point is so valuable. Did not mean to insinuate that Manroop will not play at all tonight. He has basically dropped to the seventh spot in the rotation among the guards. He’s still practicing hard (you can see him in the background of the Brandyn Akana interview above taking extra shots after practice). He still has a shot to play tonight, especially if UC Davis opts to play a soft zone to try and jam the UH post players and thus opening the perimeter. A lot depends on the performance of the others ahead of him as well. Keep in mind, it wasn’t too long ago that Ozren Pavlovic was considered one of the last players on the reserve list … before that, it was Brandon Jawato. The ladies got it done on the road >> defeated UC Davis 71-63. Successfully wrapped up their 2nd trip @ 2-2. Field 41%, 3-pt 5-12, Freeby 70% & a bad 21 TO. Man-up, win 3 for 3-3 to matched their 50% record on your 2nd trip! Make it a 5-0 @ home tonight will start the momentum, OK? ~ Jr. Kamilah Martin’s 18pts propelled her to the 17th 1000pts Wahine Scorer Club (she also is a talented rebounder with height disadvantage). ~ Fr. Ashleigh Karaitiana’s 22pts, good for a career record (she always work-hard). An Aussie from Sydney. Warriors, come watch these ladies sometime, you might learn something! I’m convinced that Coach Beeman is the reason why the Wahine is so much better this year. His new recruits and his coaching is paying off. One good coach with good recruiting can make all the difference in the world in even one year. You can do it in basketball. In football, it might take a little longer because of so many players and positions. Congratulations to the Wahine on the win and Ms. Martin for achieving 1,000 points in your career. Sorry, I mean (her) coaching. Sounds like Hauns is out for tonight. Strained petella tendon….just when he was getting back into a grove. He will be nails 2nd half of season…excited for the rest of the season and the Big West tournament! Dayton: Simple question for Gib. Would he try Brandon Spearman at PG, with another player handling the 2 spot? Carter, it starts with PG. Back in the day when Artie was backcourt mate with Tom Henderson, they were pretty much interchangeable, they were just guards, however, Tom made others around him better, could control a game, pretty much what AC did. Agreed too, other guard, wings and Bigs can help out, advancing ball, setting screens, warning PG of getting the ball picked. It is driving Gib crazy. It drives we fans at SSC crazy!. This year , no pure Point, so team has to win, by the guys who can execute the best, ,and by BW tourney time, are really working well together, winning as a unit, whomever the guards are. That 4 game road swing will be a big test, have to come out of that , with steady backcourt, or shall we say, whole team court, consistent play, and no costly turnovers, yet still D up, Rebound, inside out, and shoot well. Have to go 2-2 minimum. Yeah, PG, every team in BW, knows that is the weak area, however, other team guys have to help out as well. Hope the Ozi Point Forward can stabilize team. If not, next man up. Good group of kids, I think they will find a way to win, just so darn nerve wracking. We will be there! Cheer them on, just WIN guys! The PG spot will be by committee until somebody steps up, takes command and takes care of the ball. The PG needs to have some swagger in addition to smarts and talent. I haven’t seen any of that from any of the guards yet. Oz is getting minutes at PG because be plays with more confidence than anyone else. He doesn’t really have a PG skill set, but he’s been doing the best job. I don’t think he’s the solution at PG but at least he can hold the fort until somebody steps up. UH has the talent to win be Big West, but they will only go as far as their PG lets them. Cheap turnovers and a recent rebounding problems (UH has given up a ton of offensive rebounds recently) are giving opponents way too may extra possessions.